This is one of my favorite smoothies, not because of its cool name, but rather the sheer amount of greens I’m able to cram into my blender and still have a delicious finished product. Green smoothies are quite popular these days, and for good reason. They are perhaps the easiest and most convenient way for people to get their daily allotment of green leafy vegetables. This particular green machine smoothie recipe calls for spinach and kale, but you could just as well use any two greens. Other good options include dandelion greens, arugula, lettuce, beet greens, radish greens, collard greens, cilantro, and any wild greens you can get your hands on. If you only have one green on hand, simply use twice as much to compensate. Each green leafy vegetable imparts its own unique health benefits and eating a variety of greens will increase the overall amount of nutrition you receive. 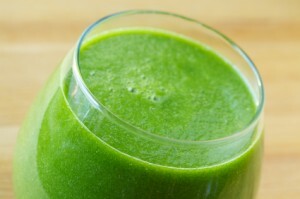 By blending greens into a smoothie you increase the absorption and assimilation of vitamins and minerals. Place the ingredients into your blender and blend for 30-45 seconds or until desired consistency is reached. Please leave a comment below if you try this smoothie. Happy Blending! easy to make, no fancy ingredients.